The Chinese alligator (Alligator sinensis) (simplified Chinese: 扬子鳄; traditional Chinese: 揚子鱷, yáng zǐ è), also known as the Yangtze alligator, China alligator, or historically the muddy dragon, is a critically endangered crocodilian endemic to China. The American alligator and it are the two living species in Alligator, a genus in the family Alligatoridae. Dark gray or black in color with a fully armored body, the Chinese alligator grows to 1.5–2.1 metres (5–7 ft) in length and weighs 36–45 kilograms (80–100 lb) as an adult. It brumates in burrows in winter and is nocturnal in summer. Mating occurs in early summer, with females most commonly producing 20–30 eggs, which are smaller than any other crocodilian. It is an opportunistic feeder, primarily eating fish and invertebrates. A vocal species, adults bellow during the mating season and young vocalize to communicate with their parents and other juveniles. Captive specimens have reached age 70, and wild specimens can live to over 50. Living in bodies of fresh water, the Chinese alligator's distribution range is restricted to six regions in the province of Anhui as of 2015. Originally living as far away from its current range as Japan, the species previously had a wide range and population, but beginning in 5000 BC, multiple threats, such as habitat destruction, caused the species' population and range to decline. The population in the wild was about 1000 in the 1970s, decreased to below 130 in 2001, and grew after 2003, with its population being about 300 as of 2017. Listed as critically endangered by the International Union for Conservation of Nature, multiple conservation actions have been taking place for this species. Several breeding facilities, both in China and foreign countries, have bred specimens in captivity and sometimes released them back into the wild. The Chinese alligator has been a part of Chinese literature since the third century. In the late 1200s, Marco Polo became the first person outside of China to write about it. In many writings, the Chinese alligator has been associated with the Chinese dragon. Many pieces of evidence suggest that the Chinese alligator was the inspiration for the Chinese dragon. The alligator was described by French naturalist Albert-Auguste Fauvel in 1879, as Alligator sinensis. The genus Alligator had previously contained only the American alligator since its creation in 1807. Fauvel wrote a detailed description of the species in a book titled Alligators in China: Their History, Description & Identification, including information about its historical account. In 1947, it was suggested to group the Chinese alligator in a separate genus from its American relative, due to the Chinese alligator's bony plate on its upper eyelid. This bony plate is present in caimans, but is rarely present in the American alligator. At the time, the plate was thought to not appear in the American alligator at all. This produced the belief that the Chinese alligator's relationship with other crocodilians was between caimans and American alligators. Paulus Edward Pieris Deraniyagala described the genus Caigator the same year, which only contained the Chinese alligator, making its scientific name Caigator sinensis. However, paleontology has shown that the Chinese alligator was developed as an offshoot of other now-extinct animals in the genus Alligator. This and the fact that the American alligator does infrequently have a bony plate on its eyelid has caused Caigator sinensis to now be classified as a synonym of Alligator sinensis. One of the smallest species of crocodilians, the Chinese alligator attains a length of 1.5–2.1 metres (5–7 ft) and weight of 36–45 kilograms (80–100 lb) as an adult. Females are roughly three-quarters the length of males. It is less than half the size of the American alligator, which typically grows to a length of 3.4 metres (11.2 ft) for males and 2.5 metres (8.2 ft) for females. Reports are known of alligators in China reaching 3.0 metres (10 ft) in past centuries, but these are thought to no longer be accurate. The Chinese alligator is almost completely black or dark gray in color as an adult. It has a short and broad snout, which points slightly upwards and narrows at the end. Its head is robust, more so than that of the American alligator, with a bony septum dividing its nostrils. It has 72–76 teeth, of which 13–14 are maxillary, five are premaxillary, and 18–19 are mandibular. Unlike the American alligator, the Chinese alligator is fully armored, including its belly. It contains up to 17 rows of scales across its body, which are soft on its belly and the side of its body, and rougher on its back. Its upper eyelids have bony plates on them, a feature usually not present in the American alligator. Its tail is wider than that of the American alligator. It does not have webbed feet, in contrast to the American alligator, which has extensive webbing on its toes. 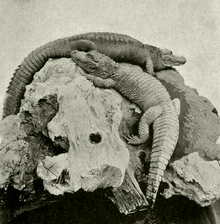 The Chinese alligator brumates[lower-alpha 1] in burrows during winter. After this period of dormancy, it frequently spends time in the sun before summer begins. It is nocturnal throughout summer, feeding at night and sheltering in the daytime, to avoid both humans and the summer heat. This behavior gives it the ability to live in areas where humans are common. A docile species, it does not intentionally hurt humans outside of potential extreme circumstances. This alligator brumates from late October to mid-April, emerging in early May. It constructs its burrows next to ponds and other small bodies of water, using its head and front legs to dig into the ground. They can be large and complex, containing multiple rooms, water pools, and entrances. Most of them are 10–25 metres (33–82 ft) long, with each room containing enough space for alligators to turn around after entering. Outside of winter, the burrows serve as retreat sites for the alligators and in summer are where the alligators take shelter in the daytime. The temperature inside them is never colder than 10 °C (50 °F). The burrows can be problematic for farmers, as they cause destruction of farm dykes. The breeding season of the Chinese alligator is early summer, with the rate of mating being the highest in mid-June. The alligator breeds earlier in the year if temperatures are higher. During the time of mating, males commonly search around ponds to find a mate and both male and female specimens are often aggressive to each other. The species exhibits polygamy, with single males mating with multiple females and/or a single female mating with several males. A study of 50 clutches showed multiple paternity in 60% of them, with up to three males contributing. Nests are typically built about 2–3 weeks after mating, from July to late August. Constructed by the females, they are composed of rotting plants, such as leaves, and are 40–70 centimetres (16–28 in) high. Females prefer to assemble them in areas that have a thick canopy and are far from human disturbance. Because islands frequently satisfy both of these conditions, they are often used as nesting sites. Nests are always located near water sources. Individuals often return to the same nesting site yearly, although intraspecific competition and environmental changes can force them to change nesting sites. Generally laid at night, mating typically produces 20–30 eggs, although according to the International Union for Conservation of Nature (IUCN), the alligator has the capability of laying 10–40 eggs. After the eggs are laid, the females sometimes leave the nest, but other times stay to protect the eggs. The eggs are about 6 centimetres (2.4 in) in length, 3.5 centimetres (1.38 in) in diameter, and 45 grams (1.59 oz) in weight, making them smaller than the eggs of any other crocodilian. They are typically incubated for about 70 days. On average, the temperature of incubation is 25–26 °C (77–79 °F), including the day and night. This temperature controls whether a young alligator will be male or female, a feature present in all crocodilians. A higher incubation temperature also increases the hatching rate. Young hatch in September, assisted by their mothers. Newborn alligators, like their eggs, are the smallest of any crocodilian, with a length of 20–22 centimetres (7.87–8.66 in) and weight of 25–30 grams (0.88–1.06 oz). Unlike adults, they have light speckles on their bodies and heads. Mothers help them leave the nest and bring them to the water after hatching. They grow very little in their first year, due to being able to feed for only about 2 months after hatching before the winter. A study published in the journal Comparative Biochemistry and Physiology Part A: Molecular & Integrative Physiology showed that the Chinese alligator is two-thirds the length of the American alligator and one-half its weight at birth, but is one-half its length and one-tenth its weight after one year. Young depend on their mothers to protect them during their first winter, as their small size makes them an easy prey target. Both sexes participate in bellowing choruses during the mating season as adults. Lasting an average of 10 minutes, the alligators remain still for the entirety of the chorus, with both sexes responding equally in rough unison. The main purpose of these bellows is to call out to alligator specimens to collect at a specific pond, where individuals choose mates and engage in copulation. According to The Journal of Experimental Biology, alligators may also bellow to publicize their size, a behavior which occurs in multiple other vertebrates. The size of a specimen is a significant factor for mating; females only mate with males larger than themselves. Bellowing is most common at 6:00–7:00 am and 11:00–12:00 am CST. Although these bellows occur most frequently during the mating season, adults also bellow throughout the rest of the year. The range of the Chinese alligator is extremely restricted; as of 2015, the only places it is confirmed to live in the wild are Xuancheng, Nanling County, Jing County, Wuhu, Langxi County, and Guangde County – six counties and cities in the province of Anhui, occupying an area of about 5 square kilometres (5,000,000 m2). It may also occur in Jiangsu and Zhejiang, but its presence in those provinces is uncertain. It is the only species in the family Alligatoridae that lives on a continent other than North or South America. The oldest record of the Chinese alligator is a skeleton fragment found in western Japan. The fossil is estimated to be from the late Pliocene period, 3 million years ago (Mya). The skeleton showed that the species was larger at the time than it is currently, with a total length of at least 2 metres (6.6 ft). Alligators are believed to have moved into various parts of Japan either before 25 Mya or after 10 Mya and were extirpated from there during the Plio-Pleistocene period, due to tectonic changes and the country's poor climate. The population of the Chinese alligator began to decline in 5000 BC, when human civilization started to grow in China, after having been very abundant in the lower Yangtze area. This area was one of the first places in the world to farm rice, causing much of the alligator's habitat to be destroyed in favor of rice farms. In the 1700s, much of the Chinese alligator's habitat was replaced with farming fields after a large number of people had moved into the area. By the 20th century, its range was reduced to a few small areas around the Yangtze. In the 1950s, the alligator was found in three distinct areas: the southern area of the Yangtze (Chang Jiang) from Pengze to the western shore of Lake Tai (Tai Hu), the mountainous regions of southern Anhui, and the provinces of Jiangsu and Zhejiang, primarily in lakes, streams, and marshes. By the 1970s, it was restricted to small parts of southern Anhui and Zhejiang, at which time the population was about 1,000. In 1998, the population of the Chinese alligator was the lowest it had ever been; the largest area it lived in was a small pond along the Yangtze surrounded by farmland, which held 11 alligators. In 1999, the Wildlife Conservation Society estimated that 130–150 individuals were left in the wild. According to The New York Times, the population was less than 130 in 2001; at this time, alligators sometimes wandered around to look for a suitable habitat, but were unsuccessful due to their habitat having been turned into rice fields. In 2003, the population began to gradually increase after having been roughly stable between 1998 and 2003. A survey of the population by the Anhui National Nature Reserve for Chinese Alligator (ANNRCA) in 2005 deduced that between 92 and 114 adults and 66 young remained in the wild. The survey reasoned that the species' population was growing in four sites, but stable in the rest of the alligator's range. An article published by the Journal of Genetics in 2012 estimated the population at the time to be 120–150. A 2015 survey observed 64 individuals, of which 32 were adults, estimating that the total number of adults was 68–86 and the total population 136–173. Wang Renping, the head of the ANNRCA, stated in 2017 that about 300 specimens existed in the wild, some of which had been born captive and reintroduced to the wild. As of 2018 the population is not considered to be further declining. Considered to be one of the most endangered crocodilians in the world, the Chinese alligator's biggest threats in the late 20th century were human killing and habitat loss. A majority of the species' wetland habitats were destroyed to construct rice paddies and dams. During the 1970s and 1980s, humans sometimes killed the alligators, because they believed they were pests, out of fear, or for their meat. Thought to have the ability to cure colds and prevent cancer, the organs of the Chinese alligator were sometimes sold for medicinal purposes. In several restaurants and food centers in China's more prosperous areas, young alligators were allowed to roam free with their mouths taped shut, and were subsequently killed for human consumption, served as a dish of rice, vegetables, and chopped up alligator flesh. In the late 20th century, people living in the range of the Chinese alligator ate its meat due to believing that it was dragon meat. The Chinese alligator is listed as a Class I endangered species as of 1972, which gives it the highest possible degree of legal protection and makes killing or capturing the species in the wild forbidden. It is listed as a CITES Appendix I species on China's Protection List. Following six previous assessments as endangered from 1982 to 1994, it is classified as critically endangered on the IUCN Red List as of 2017. In 1982, the Anhui National Nature Reserve for Chinese Alligator (ANNRCA) was created, a reserve spanning across the entire range of the Chinese alligator, now covering an area of 18,565 hectares (45,880 acres). As of 2016, at least 20,000 Chinese alligators[lower-alpha 2] are living in captivity due to captive-breeding programs, the first initiated in the 1970s. Captive-born Chinese alligators have been reintroduced into their native range, boosting the wild population. Six specimens were released from captivity in 2007, followed by six more in June 2015. As of June 2016, the largest group of Chinese alligators to have been released in the wild was when 18 specimens were reintroduced to Langxi County, part of the species' native habitat, on May 22, 2016. These releases have proven successful, with individuals adapting well to a life in the wild and breeding. A year after the 2007 release, 16 young alligators were found living in the wild. 60 alligator eggs were observed in 2016, distributed in three nests at a wetland park. Although a typhoon in September the same year flooded and eliminated two of the nests, three hatchlings were found in the same area several days after. The two largest breeding centers for the Chinese alligator are located in, or near, the areas where Chinese alligators are still found in the wild. The Anhui Research Center for Chinese Alligator Reproduction (ARCCAR) is the largest of them, housing roughly 15,000 Chinese alligators as of 2016. The center is located 5 kilometres (3.1 mi) from the city of Xuancheng,[lower-alpha 3] where it makes use of a series of ponds in a small valley. Founded in 1979, the ARCCAR was stocked with 212 alligators collected from the wild over the first decade after its establishment, and received alligator eggs collected by the area's residents and the ARCCAR's own staff from the nests of wild alligators as well. In 1988, the first eggs by human-bred alligators were laid. The reserve decided to reintroduce some of its alligators in the wild in 2001, which was carried out in 2003 when three alligators were released. The alligator breeding was so successful that the ARCCAR began to use the alligators for local meat consumption and live animals for the European pet market, with the profits from these activities continuing to fund the breeding centers. The other major breeding center for the species is the Changxing Chinese Alligator Nature Reserve (CCANR) or Changxing Nature Reserve and Breeding Center for Chinese Alligators (CNRBRCCA), located in Changxing County, Zhejiang, about 92 kilometres (57 mi) east of the ARCCAR. [lower-alpha 4] Originally known as the Yinjiabian Alligator Conservation Area (尹家边扬子鳄保护区), the breeding center was established in 1982. Unlike the ARCCAR, where alligator eggs are collected by the center's staff for incubation in controlled condition, the CCANR allows eggs to hatch naturally. According to a 2013 official report, the CCANR housed almost 4,000 alligators, including 2,089 young (1–3 years old), 1,598 juveniles (4–12 years old), and 248 adults (13+ years old). By 2016, 5,500 specimens were housed at the center. In 2003, the ARCCAR received a donation of $1.2 million from the State Forestry and Grassland Administration of China (SFGA) and $0.74 million from the government of Anhui. This allowed the organization to create two new breeding areas to hold the alligators, 1.6 hectares (4.0 acres) each, as well as heighten the existing fence. The same year, the CCANR received a donation of $0.6 million from the SFGA and $0.8 million from the government of Changxing, enabling it to reinstate wetlands for the alligators and enhance its facilities. Both the ARCCAR and the CCANR position themselves as tourist attractions, where paying visitors can view alligators and learn about them. The Chinese alligator is also kept and bred at many zoos and aquariums in North America and Europe. Some individuals bred there have been returned to China for reintroduction to the wild. The first time the alligators were ever transported internationally is believed to have been when several were taken from China to the United States in the 1950s. In November 2017, four Chinese alligators were transported from their natural habitat in China to Shizuoka, Japan, which was the first time since 2006 any individuals of the species were taken to another country. Among the North American zoos and aquariums keeping this species are the Bronx Zoo, Cincinnati Zoo, Philadelphia Zoo, San Diego Zoo, Santa Barbara Zoo, Smithsonian National Zoological Park, and St. Louis Zoo. In Europe, about 25 zoos and aquariums keep the species, such as the Barcelona Zoo (Spain), Bioparco di Roma (Italy), Crocodile Zoo (Denmark), Moscow Zoo (Russia), Pairi Daiza (Belgium), Paradise Wildlife Park (England), Parken Zoo (Sweden), Prague Zoo (Czech Republic), Tallinn Zoo (Estonia), Tierpark Berlin (Germany), and Wildlands Adventure Zoo Emmen (Netherlands). Some writers have associated the Chinese alligator with the Chinese dragon. The alligator is thought to have been the inspiration for it. The theory that the Chinese dragon was a mythological version of the Chinese alligator was widespread in the early 1900s, and the idea was later revisited by John Thorbjarnarson and Xiaoming Wang. According to The New York Times, the association with the "beneficent" mythological creature is an advantage for the species. 1 2 Iijima, Masaya; Takahashi, Keiichi; Kobayashi, Yoshitsugu (2016). "The oldest record of Alligator sinensis from the Late Pliocene of Western Japan, and its biogeographic implication". Journal of Asian Earth Sciences. 124: 94–101. Bibcode:2016JAESc.124...94I. doi:10.1016/j.jseaes.2016.04.017. 1 2 3 4 5 6 7 8 9 10 11 12 13 14 15 16 17 18 19 20 21 22 23 Jiang, H.; Wu, X. (2018). "Alligator sinensis". IUCN Red List of Threatened Species: e.T867A13086708. doi:10.2305/IUCN.UK.2018-1.RLTS.T867A3146005.en (inactive March 9, 2018). ↑ Wu, Ziaobang; Zhou, Kaiya; Wang, Yiquan; Zhu, Weiquan (October 2003). "Complete mitochondrial DNA sequence of Chinese alligator, Alligator sinensis, and phylogeny of crocodiles". Chinese Science Bulletin. 48 (19): 2050–2054. Bibcode:2003ChSBu..48.2050W. doi:10.1360/03wc0076 (inactive December 20, 2018). Retrieved December 20, 2018. 1 2 "The largest group of Chinese alligators released to the wild". UNDP in China. June 8, 2016. Archived from the original on April 24, 2017. Retrieved April 23, 2017. 1 2 3 4 5 6 7 8 Perry, Tony (July 4, 2012). "San Diego Zoo gets two Chinese alligators in preservation effort". Los Angeles Times. Ross Levinsohn. Archived from the original on March 19, 2018. Retrieved December 9, 2018. 1 2 3 4 Barbour, Thomas (April–September 1910). "A Note regarding the Chinese Alligator". Proceedings of the Academy of Natural Sciences of Philadelphia. 62 (2): 464–467. JSTOR 4063434. ↑ Thorbjarnarson & Wang 2010, p. 34. 1 2 3 4 5 Neill 1971, pp. 293–294. ↑ "Alligator". Integrated Taxonomic Information System. Archived from the original on January 26, 2019. Retrieved January 25, 2019. ↑ Fauvel 1879, p. 33. 1 2 3 4 5 6 7 "Chinese Alligator (Alligator sinensis)". Crocodilians: Natural History & Conservation. Archived from the original on December 25, 2011. Retrieved January 2, 2012. 1 2 3 4 5 6 7 8 Reading & Miller 2000, p. 72. ↑ "American alligator". Smithsonian's National Zoo. April 25, 2016. Archived from the original on November 6, 2018. Retrieved December 12, 2018. 1 2 3 Grigg 2015, p. 6. 1 2 3 4 5 6 7 "Chinese Alligator". Saint Louis Zoo. Archived from the original on May 8, 2016. Retrieved December 10, 2018. 1 2 3 4 5 6 7 8 9 10 11 12 "Chinese alligator". Smithsonian's National Zoo. April 25, 2016. Archived from the original on December 9, 2018. Retrieved December 9, 2018. ↑ Ross 1998, p. 12. ↑ Zhang, F.; Li, Y.; Guo, Z.; Murray, B. R. (March 20, 2009). "Climate warming and reproduction in Chinese alligators". Animal Conservation. 12 (2): 128–137. doi:10.1111/j.1469-1795.2009.00232.x. ↑ Wang, Huan; Yan, Peng; Zhang, Shengzhou; Sun, Long; Ren, Min; Xue, Hui; Zhang, Fang; Wu, Rong; Wu, Xiaobing (December 2017). "Multiple paternity: A compensation mechanism of the Chinese alligator for inbreeding". Animal Reproduction Science. 187: 124–132. doi:10.1016/j.anireprosci.2017.10.016. PMID 29103625. 1 2 3 4 5 6 7 Reading & Miller 2000, p. 73. 1 2 Jianjun, Wang; Wu, Xiaobing; Dawei, Tian; Jialong, Zhu (January 2011). "Nest-site Use by the Chinese Alligator ( Alligator sinensis ) in the Gaojingmiao Breeding Farm, Anhui, China". Asian Herpetological Society. 2 (1): 36–40. doi:10.16373/j.cnki.ahr.170066. 1 2 3 4 5 Zhang, Fang; Messenger, Kevin; Wang, Yong (2015). "Relationship between nest defence behaviours and reproductive benefits in Chinese alligators". Amphibia-Reptilia. 36 (2): 141–147. doi:10.1163/15685381-00002990. 1 2 Thorbjarnarson & Wang 2010, p. 121. 1 2 He, L. J.; Wang, X. M.; Ding, Y. Z.; Shao, M.; Wang, G. H.; Xie, W. S.; Thorbjarnarson, J. (January 1, 2012). "Influence of temperature on egg incubation of the wild Chinese alligator (Alligator sinensis)". Dong Wu Xue Bao. 3 (48): 420–424. Retrieved February 17, 2019. 1 2 3 Thorbjarnarson & Wang 2010, p. 97. ↑ Herbert, J. D.; Coulson, T. D.; Coulson, R. A. (April 2002). "Growth rates of Chinese and American alligators". Comparative Biochemistry and Physiology Part A: Molecular & Integrative Physiology. 131 (4): 909–916. doi:10.1016/S1095-6433(02)00027-2. 1 2 IUCN 1982, p. 284. 1 2 Thorbjarnarson & Wang 2010, p. 103. ↑ Wang, Xianyan (May 4, 2007). "Acoustic signals of Chinese alligators (Alligator sinensis): Social communication". Journal of the Acoustical Society of America. 121 (5): 2984–2989. doi:10.1121/1.2714910. ↑ Wang, Xianyan; et al. (2009). "Why do Chinese alligators (Alligator sinensis) form bellowing choruses: A playback approach". The Journal of the Acoustical Society of America. 126 (4): 2082–7. Bibcode:2009ASAJ..126.2082W. doi:10.1121/1.3203667. PMID 19813817. Retrieved December 15, 2018. 1 2 Wang, Xianyan; Wang, Ding; Wang, Xiaobing; Wang, Renping; Wang, Chaolin (January 1, 2006). "Congregative effect of Chinese alligator's bellowing chorus in mating season and its function in reproduction". Dong Wu Xue Bao. 4 (52): 663–668. Retrieved February 18, 2019. 1 2 Reber, Stephan A.; Nishimura, Takeshi; Janisch, Judith; Robertson, Mark; Fitch, W. Tecumseh (2015). "A Chinese alligator in heliox: formant frequencies in a crocodilian". Journal of Experimental Biology. 218 (15): 2442–2447. doi:10.1242/jeb.119552. PMC 4528706. PMID 26246611. 1 2 3 4 5 6 7 Yoon, Carol Kaesuk (August 21, 2001). "Rare Alligator Is Threatened As China Feeds Its People". The New York Times. A.G. Sulzberger. Archived from the original on December 9, 2018. Retrieved December 9, 2018. 1 2 3 Thorbjarnarson, John. "Chinese Alligator". Wildlife Conservation Society. Archived from the original on December 14, 2018. Retrieved December 11, 2018. 1 2 3 4 Reading & Miller 2000, p. 75. ↑ Thorbjarnarson, John; et al. (2002). "Wild populations of the Chinese alligator approach extinction". Biological Conservation. 103 (1): 93–102. doi:10.1016/s0006-3207(01)00128-8. 1 2 Gallagher, Sean (April 26, 2011). "The Chinese Alligator, A Species On The Brink". National Geographic Society Newsroom. Archived from the original on December 9, 2018. Retrieved December 9, 2018. 1 2 3 4 5 Lixin, Zhu (December 11, 2017). "Efforts continue to save endangered Chinese alligators". China Daily. Archived from the original on January 6, 2019. Retrieved January 6, 2019. ↑ Chuanpeng, Nie; Yanyan, Li; Zhao, Juan; Wu, Xiaobing (2012). "Extremely high major histocompatibility complex class IIb gene intron 2 variation and population structure in Chinese alligator". Journal of Genetics. 93: 86–91. doi:10.1007/s12041-012-0174-2. 1 2 "Ten Threatened and Endangered Species Used in Traditional Medicine". Smithsonian. Smithsonian Institution. October 18, 2011. Archived from the original on March 1, 2015. Retrieved January 27, 2015. ↑ Chang, L. T.; Olson, R. (May 2008). "Gilded Age, Gilded Cage". National Geographic. ↑ "Chinese Alligator". CITES. Archived from the original on February 19, 2019. Retrieved February 18, 2019. ↑ Thorbjarnarson & Wang 2010, p. 10. 1 2 3 "Chinese Alligator". Cincinnati Zoo and Botanical Garden. Retrieved January 29, 2012. 1 2 Dasgupta, Shreya (November 7, 2016). "Discovery of baby Chinese alligators boosts hope for rare species". Mongabay. Archived from the original on February 18, 2019. Retrieved February 17, 2019. 1 2 Thorbjarnarson & Wang 2010, p. 195. ↑ Thorbjarnarson & Wang 2010, pp. 175–176. ↑ Thorbjarnarson & Wang 2010, pp. 200–202. 1 2 Thorbjarnarson & Wang 2010, p. 205. 1 2 Liu, Victor H. (December 2013). "Chinese Alligators: Observations at Changxing Nature Reserve & Breeding Center" (PDF). IRCF Reptiles and Amphibians. 20 (4): 172–183. Retrieved January 29, 2019. ↑ "尹家边扬子鳄保护区" [Yinjiabian Chinese Alligator Reserve]. Huzhou Municipal People's Government (in Chinese). November 26, 2008. Archived from the original on June 14, 2017. Retrieved December 14, 2018. ↑ "从抢救保护到放归发展　浙江长兴成功繁殖扬子鳄" [From rescue and protection to reintroduction development. Changxing in Zhejiang successfully propagated Chinese Alligators]. China Government Network Central (in Chinese). April 29, 2013. Archived from the original on February 22, 2014. Retrieved February 4, 2014. ↑ Thorbjarnarson & Wang 2010, pp. 195,198,205. ↑ "World's Most Endangered Alligator Making a Comeback – in Shanghai". WCS Newsroom. October 26, 2016. Archived from the original on December 11, 2018. Retrieved December 10, 2018. ↑ "Chinese alligator". Philadelphia Zoo. Archived from the original on December 10, 2018. Retrieved December 10, 2018. ↑ "List of Animals". Santa Barbara Zoo. Archived from the original on December 15, 2018. Retrieved April 13, 2018. ↑ "Chinese alligator". Zootierliste. Archived from the original on December 10, 2018. Retrieved December 11, 2018. 1 2 3 Thorbjarnarson & Wang 2010, pp. 54–58. 1 2 3 Courtney 2018, p. 94. Ross, J. P., ed. (1998). Crocodiles. Status Survey and Conservation Action Plan (PDF) (2 ed.). IUCN/SSC Crocodile Specialist Group. ISBN 2-8317-0441-3. Retrieved 13 March 2019.